June will mark the anniversary of the opening of Pink Barre/Sandy Springs, a locally-owned barre fitness studio in City Walk. The owners and co-founders of the Pink Barre have broken into a market dominated by national barre fitness chains. (Purre Barre, Barre3, The Barre Method) but Pink Barre’s practices go beyond its studio classes, curating meaningful experiences to empower women of all ages to inspire one another to live healthy and accomplished lives. As a result, they have had tremendous success in their first year. Owners Maureen Chatelain and Tara Joiner have now opened four metro locations. Visit them on Facebook at PinkBarreSandy. 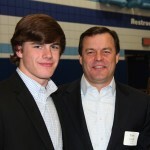 In March, The Lovett School hosted the second annual Father/Son Dinner for Upper School boys and their fathers/guests. The purpose of the event was to celebrate the distinctive importance of the father/son relationship and the importance of cross generational relationships while focusing on the values of Lovett’s character pledge, including: honesty, respect, responsibility, compassion, courage, and integrity. Five seniors shared personal testimony about their relationship with their fathers and the guest speaker was former NFL quarterback Archie Manning. Manning spoke to the boys and their guests about the importance of leadership and lessons learned over a lifetime in football and as a father to three boys. His tone was conversational and welcoming. One guest described the exchange this way, “It felt as though we were sitting around the Manning dinner table swapping stories.” Manning engaged the audience, challenged the boys to lead in all aspects of their lives, and even confirmed that his son Peyton hopes to play another year in the NFL. 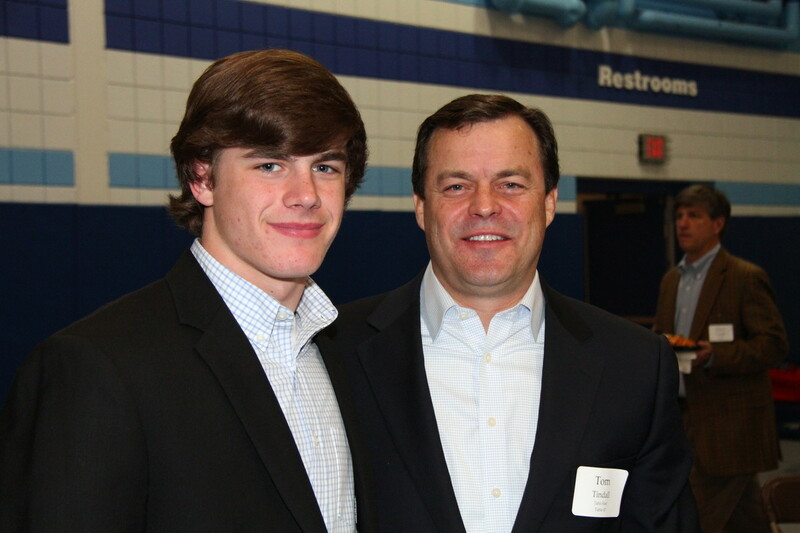 Pictured is 10th grader Brady Tindall and his father, Tom Tindall. Forbes has named Northside Hospital to its list of America’s Best Employers in a survey that polled U.S. employees across all industries. Northside Hospital ranks number 23 in the magazine’s list of 500 employers and is one of 14 Georgia employers included in the overall rankings. No other Georgia hospitals were ranked, and only one in the U.S. – the University of Iowa Hospital & Clinics – ranked higher than Northside. Forbes selected employers based on independent survey data from Statista.com. More than 20,000 American workers, across all industry sectors employing more than 2,500 workers, were anonymously polled. For more information, visit Careers.Northside.com. With the generous support from the Susan G. Komen for the Cure Greater Atlanta Affiliate and It’s The Journey, producer of the Atlanta 2-Day Walk for Breast Cancer, Northside Hospital is able to continue to provide funding for screening mammograms and other breast diagnostic procedures such as ultrasounds, biopsies and more for women who cannot afford them. In 2014, 1,703 underinsured women received breast cancer screening and diagnostic services through the Northside Hospital Cancer Institute. Fifteen breast cancers were detected. Early detection of breast cancer saves the lives of thousands of women each year. For more information, visit Northside.com/breastcancerscreenings. Andee’s Army, a 501(c)3 nonprofit that provides assistance to families of children and youth receiving medical treatment for acquired brain injuries and other neurological injuries, is cooking up plans for the first annual Andee’s Army Summer BBQ Festival at the American Legion Post 140 near Chastain Park, noon to 5 p.m. on Saturday, June 20. The barbecue cookoff will feature over 15 registered barbecue teams who will be slow cooking their culinary creations up to a day in advance. The day of events will consist of two contests and awards by both local celebrity judges and a People’s Choice Awards. In addition to barbecue favorites, expect live entertainment, food, non-alcoholic beverages, beer and wine for purchase, and a 50/50 raffle. An Andee’s Army invitational softball tournament will be hosted simultaneously by NYO at Chastain Park to round out a full day of family offerings. Tickets are $25, $10 for children 12 and younger. Reserve your spot no later than June 19. Designated parking and shuttles provided. The American Legion Post 140 is located at 3905 Powers Ferrry Road on Chastain Park. AndeesArmy.com/events. Alex’s Lemonade Stand Foundation (ALSF), a nonprofit dedicated to finding cures for all kids with cancer, invites volunteers across the country to take a stand against childhood cancer when Alex’s Lemonade Days returns, June 12-14. ALSF’s National Lemonade Days began in 2004 when Alex Scott set her sights on raising $1 million to fight childhood cancer, including hers. Alex invited volunteers to join her in hosting lemonade stands to help achieve her goal one dollar and one lemonade stand at a time. Through the help of these volunteers, Alex would reach her goal before losing her life to cancer in August of that year. Each June, the weekend before Father’s Day, supporters everywhere contribute to a cure. The Foundation was built upon the principle that you are never too young to make a difference in the lives of others. For more information and to sign up to host a lemonade stand, visit: AlexsLemonade.org/LemonadeDays. 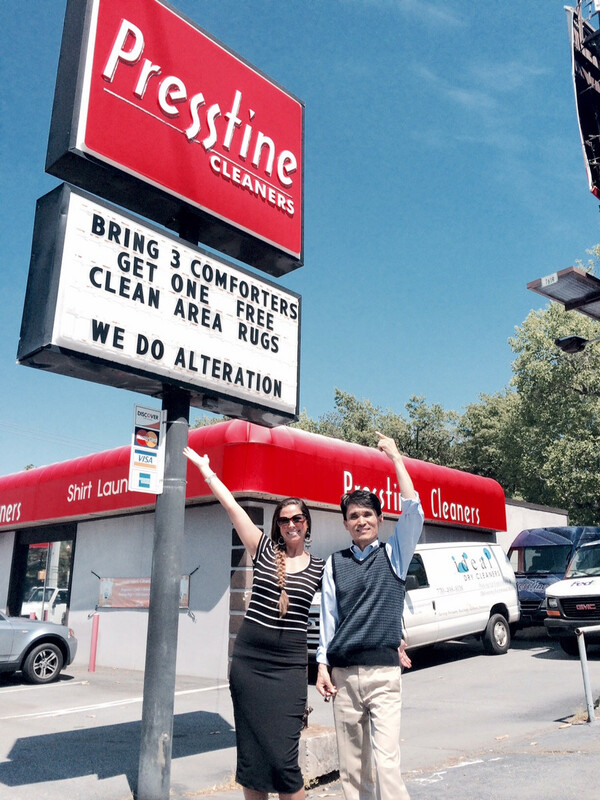 Recently, a team of 20 dry cleaning owners from Japan, Australia, England and Canada visited Georgia and made a point of stopping at Presstine Cleaners in Buckhead, at the suggestion of dry cleaning equipment companies that serve the industry. These teams were preparing for an international dry cleaning show at the Georgia World Congress Center. Industry leaders visited Presstine to compare the machines used, the customer management, and the overall dry cleaning process. Groups were given a 45-minute tour of the facilities and the operational procedures of Presstine Cleaners. Himitsu, the upscale lounge from the team behind Umi in Buckhead, announces award-winning mixologist Shingo Gokan as its creative director. The upscale lounge, which is set to open its doors adjacent to Umi in May, promises an intimate, Japanese speakeasy experience with a distinct modern vibe. The semi-private (reservation only) lounge will offer an elegant spot to enjoy a craft cocktail or some sake before or after dinner at Umi, along with bites from Umi chef Fuyuhiko Ito. Himitsu is located at 3050 Peachtree Road N.E.